Calva Louise – an English/Venezuelan/Mãori three piece – have battered their way through the past 2 years, releasing single after single and touring (quite literally) here, there and everywhere, and they’ve somehow made an even bigger noise in the start of this year with their debut album Rhinoceros released at the beginning of February. The band, fronted by raucous and passionate Jess Allanic, are distinctive and memorable in both their live and studio work. 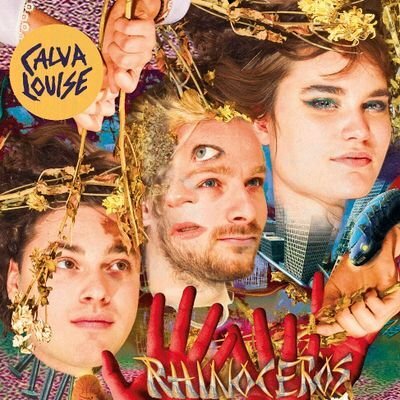 Their long-awaited album Rhinoceros takes its inspiration from a 1959 avant-garde play of the same name, where rural Frenchmen and women are plagued with a virus that starts to turn them into Rhinos (I know). It is a dramatised and quasi-mystical post-war critique of fascism that holds its gaze on issues of conformity, logic, hysteria, division. Calva’s decision to allude to such a work in their album is eerily fitting of the current climate we find ourselves in. It sends a rather blunt message of resistance: resisting the fear-mongering, the temptations to give in to the oppressively wicked world that we can’t seem to get out of. Fittingly, the opening track, ‘I Heard a Cry’, is an anthem which suits no other description, setting the tone for their whole work; Jess employs her Venezuelan heritage with her Spanish lamenting on ‘No Hay’; their dizzy, dreamy punk culminates perfectly in tracks hidden in the latter half of the album, namely ‘Wondertale’ and ‘Down the Stream’. Rhinoceros refuses to drop its vivacity for a second, fuelled with flirty riffs and drums that you need to stand up to hear properly; 10 tracks of absolutely fine-tuned and clever carnage. It is an album that doesn’t have any cares as much as it has all the cares in the world, a thought-provoking and textured album that never loses its vibrancy and the distinctive sense that you’re hearing something new. Calva Louise are due to play a headline show in the Garage on the 3rd of March, where it can only get more chaotic, enchanting, loud so dust off your best Rhino mask and see what it’s all about.